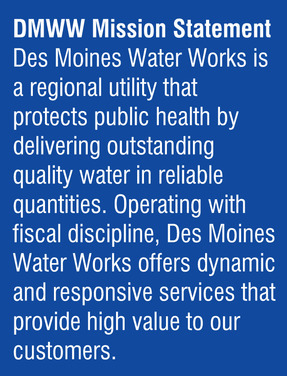 Des Moines Water Works is committed to being a vital contributor to the betterment of our community. We will consider contributions and sponsorships with external organizations that advance our mission, vision and strategic initiatives. Visit www.dmww.com/about-us/sponsorships for more information and examples of requests that will and will not be considered. Provide value to both Des Moines Water Works and the community. Reflect appropriate and accountable use of public funds. Strengthen Des Moines Water Works’ outreach efforts. Enhance Des Moines Water Works’ reputation for leadership in the environment. Build awareness and appreciation among the public for the value of water as a vital resource. Build awareness for source water quality and quantity. Align with our missions, strategic goals and annual budget. Build support for our core business objectives. Help build brand awareness of Des Moines Water Works’ mission, vision and value to the community. *All requests for contributions and sponsorships are subject to budgetary limitations. Requests must be submitted for consideration at least 60 days prior to the event or activity for which funding is requested. All requests for in-kind or financial support must be made using the Sponsorship Request Form available at www.dmww.com/about-us/sponsorships. After funds are allocated, a follow-up report of the event, program or activity will be required.